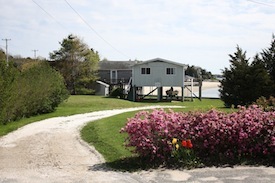 Waterfront cottages on Phinneys Harbour in the Monument Beach village of Bourne, MA. Conveniently located 5 minutes away from the Bourne Bridge. Swim and kayak right from the yard. Public beach to one side of the property, a small neighborhood of private beaches to the other side. Down the road from a children's playground and basketball and tennis courts. Short walk to the village center with a bakery, pizza shop, convenience store and home-made ice cream shop. One mile to the Cape Cod Canal bike paths, 20 minutes to Falmouth and 30 minutes to Woods Hole. These are two small cottages that are connected by a common wrap around deck. Altogether, there are three bedrooms with sleeping for six. Each cottage has its own bath, but they share a kitchen. There is a grill and outdoor furniture for sitting and eating, as well as an outdoor shower for rinsing off after being in the water or the sand. The 1/3 acre lot is at the end of Monument Ave and also happens to be adjacent to the town public beach, called Monument Beach. The main cottage has two bedrooms, a full bath, living room and kitchen. The bedrooms have one queen bed and two twin beds. There is a TV with cable in the living room and wireless internet. While the kitchen is small, it is new and clean and has all the basics including a microwave, coffee maker, teapot, and toaster. (There is no dishwasher, however.) 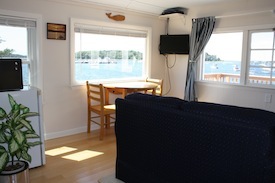 Large picture windows in the kitchen and living room overlook the harbour and the beach for stunning views all day long. The smaller cottage is a studio with its own 3/4 bath. (There is a shower, but no tub.) This room has a queen bed, along with a small couch and table. Also in this cottage are the following: mini-fridge, microwave, small Keurig coffee maker, TV with cable and wireless interenet. One picture window faces south to the public beach. Another bank of windows faces west onto the deck and out over the harbour for awesome sunsets. 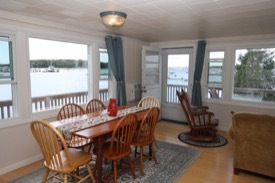 The two cottages are rented together as one unit for $2500 per week ($1900 off-peak). Rentals are from Saturday to Saturday. Sorry, but no pets. Sleeps 6. See Contact & Availability for available dates and contact information. Here is a printable flyer in pdf format. last updated 1/2/17, copyright 2014. All rights reserved.